Are you looking for a logic puzzle that uses letters rather than numbers? This alphadoku puzzle uses 9 unique letters in one word. Follow basic Sudoku rules, but with a twist. 3. Each letter occurs once in each 3x3 grid. 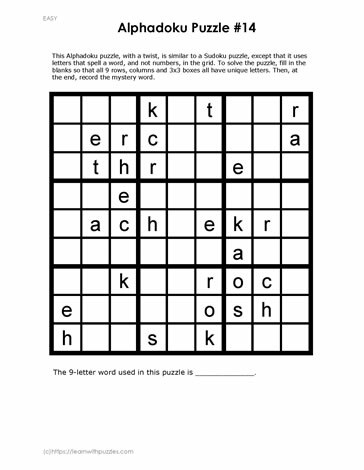 Record the nine letter word at the bottom of the puzzle when completed.